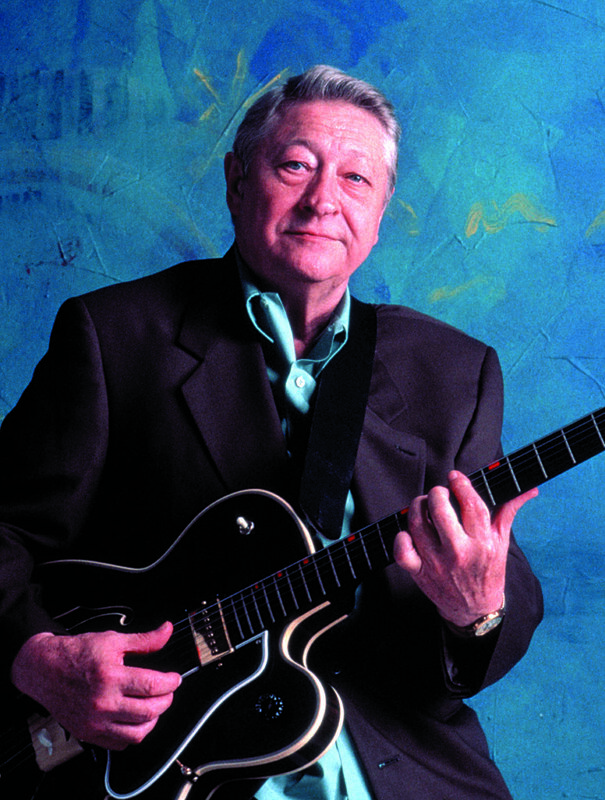 This year we lost the great Scotty Moore, Elvis Presley’s right-hand man. His thrilling guitar style changed music forever, but every passing year, the number of people who heard Scotty Moore play live in his heyday gets fewer. All we really have to go on is his studio sound, together with the well-documented accounts of the equipment he used. Scotty Moore is one of those guitar players who will forever be associated with a particular guitar model that he only used for a very brief period. It just so happens that the period in question changed music forever – and his guitar was a Gibson ES-295. Having traded in his ’52 Telecaster for the ES-295, Scotty remained a loyal Gibson man throughout his life. 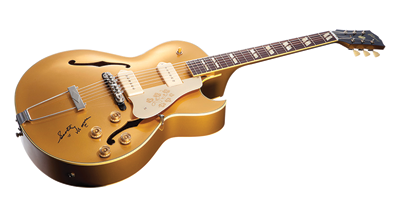 The ES-295 was basically a gold-finished ES-175 with cream-covered P-90 pickups. Scotty fitted a trapeze tailpiece and one of the Melita bridges Gretsch was using at the time. Image Credit: Scotty Moore – Ebet Roberts/Redferns. On 7 July, 1955 he traded in the ES-295 for a ’54 Gibson L-5. This all-out jazzbox had a carved spruce top rather than pressed plywood, and the staple P-90 pickups had a clarity and brightness that resembled the sound of DeArmonds. It was used on the final Sun Studios sessions and RCA recordings up until January 1957. By that time, Scotty had secured a Gibson endorsement and he was sent a ’56 Super 400, also with staple P-90s. This was the guitar he used for the rest of his time with Elvis, but you can also hear it being played by Reggie Young on Suspicious Minds and Kentucky Rain. Inevitably, ’50s Gibson jazzboxes are priced beyond many of us. But Gibson did produce an ES-295 reissue as well as a Custom Shop Scotty Moore edition. You can also find Epiphone ES-295s at more affordable prices. Any deep, fully hollow-bodied archtop with P-90 pickups should provide a strong flavour of early Scotty tone. Staple P-90s are not widely available, but can be ordered from the Seymour Duncan Custom Shop. Every guitar player has, at some point, obsessed over a favourite guitar sound and tried to recreate it. Most of us will research the rig and maybe upgrade our gear with pickups, vintage-style speakers or even exotic amplifier components. The crucial link in the signal chain that everybody seems to overlook is the microphone used to record the guitar. Sound engineers can get as obsessed over microphones as we can over guitars and amps. Microphones tend to have very strong sonic signatures, which impose themselves all over your precious guitar tone. So it makes sense here to consider the types of microphones that would have been used. According to Jim Dickinson, all of the great recordings at Sun were made with a handful of microphones – an RCA 77-DX, Shure 55, RCA 44-BX and an Altec Lansing ‘Coke bottle’ condenser. Although the Shure 55 is known as the ‘Elvis mic’, all the Sun Studios photos show him using the RCA 77-DX. It’s unlikely the delicate Altec would have been used on a loud guitar amp, so Scotty’s amp was probably mic’d with the Shure 55 or the RCA 44-BX. My best guess would be the RCA, with the Shure on Bill Black’s double bass. Ribbons are clear and natural-sounding microphones with a full, fat tone, rolled-off treble response and soft transient response. The 44-BX was a figure-eight ribbon microphone, so it picked up front and rear. Back then, microphones weren’t jammed up against the speaker cloth, so setting them further back ensures there’s a lot of room ambience mixed with the direct amp sound. The microphone signal would have gone through a valve microphone preamp and everything was recorded onto tape. Since Elvis and the boys recorded live together in the room at both Sun and RCA, there was a lot of spillage. When you mix sessions like that, you have to work with the spillage to achieve a balanced mix. If you try this in the modern style – starting with the drums and bass, then adding the instruments until you get to the vocal – everything goes wrong as soon as you push up the vocal fader. Instead, you need to start with the vocal leading and augment the spilled sound by fading the other instruments up into the mix. For Scotty’s sound, that means a lot of what you’re hearing is the guitar spilling through Elvis’ vocal microphone. If you’re obsessive, you can buy a vintage RCA 44-BX microphone or a spot-on replica from AEA. Most decent ribbon mics will get you in the ballpark: Thomann sells sub-£100 ribbon mics under the T-Bone brand. 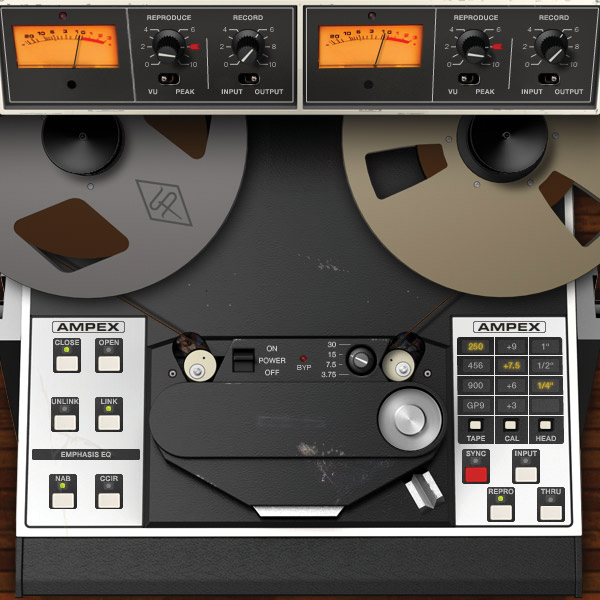 Avoid EQ and compression when you’re recording and if you’re not using tape, try applying a tape-simulator plug-in instead, such as the particularly effective Universal Audio Ampex plug-in. Sam Phillips used an Ampex tape machine to create a short delay effect known as slapback echo – and it became a signature of Scotty’s studio and live sound. Many feel that Echoplex tape-echo machines sound similar to Ray Butts’ design, but you could get very close with valve and solid-state WEM Copycats, Binsons or even a Roland Space Echo. Although nothing quite beats the sound of real tape echo, there are plenty of convincing and convenient stompbox options for slapback. Check out the Carl Martin Red Repeat and the MXR Carbon Copy. Paul Pigat swears by the Boss DM-2 and Danelectro echo pedals can be cheap but very cheerful indeed. 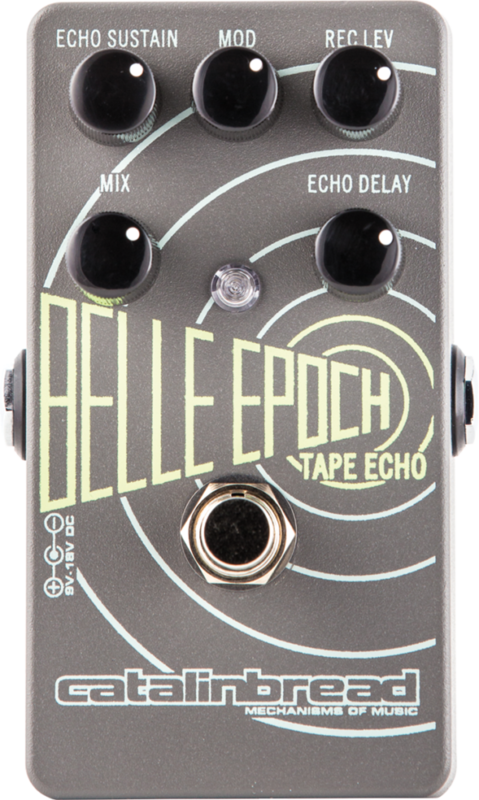 Modelling pedals such as the Catalinbread Belle Epoch will take you as close to tape echo as a stompbox can get. In the studio, you can get fantastic results using plug-in effects – and there are some extremely convincing models based on specific tape recorders. Scotty used two different amps during his tenure as Elvis’ guitar guy. The first was purchased in 1952 and pictures show it was a wide-panel tweed Deluxe. The serial number (0958) suggests it was a 5C3 model from ’52. The solid pine cabinet had a 12-inch Jensen P12R alnico speaker, 6SC7 preamp tubes, two 6V6 power tubes and a 5Y3GT rectifier. Those octal preamp tubes have lower gain than 12AX7s and their naturally smooth and fulsome midrange combines nicely with the cathode-biased 6V6s. Scotty used it live and in the studio, with the Starlite Wranglers and with Elvis on the early Sun recordings. It was traded in to put $65 towards a Ray Butts EchoSonic at the O.K. Houck Piano Co. in Memphis on 24 May, 1955. So that means the Deluxe was used on every Sun session besides the ones in July and November 1955. The songs I Forgot To Remember To Forget, Mystery Train’ and When It Rains, It Really Pours were recorded with the EchoSonic. Chet Atkins was a huge influence on Scotty so he discovered that Chet had started using an EchoSonic amplifier made by Butts up in Cairo, Illinois. These were hand-made amps featuring a built-in tape-echo effect that would have allowed Scotty to recreate Sam Phillips’ studio effects in a live setting. The price was a then-astronomic $495, which equated to two tweed Twins, plus change. 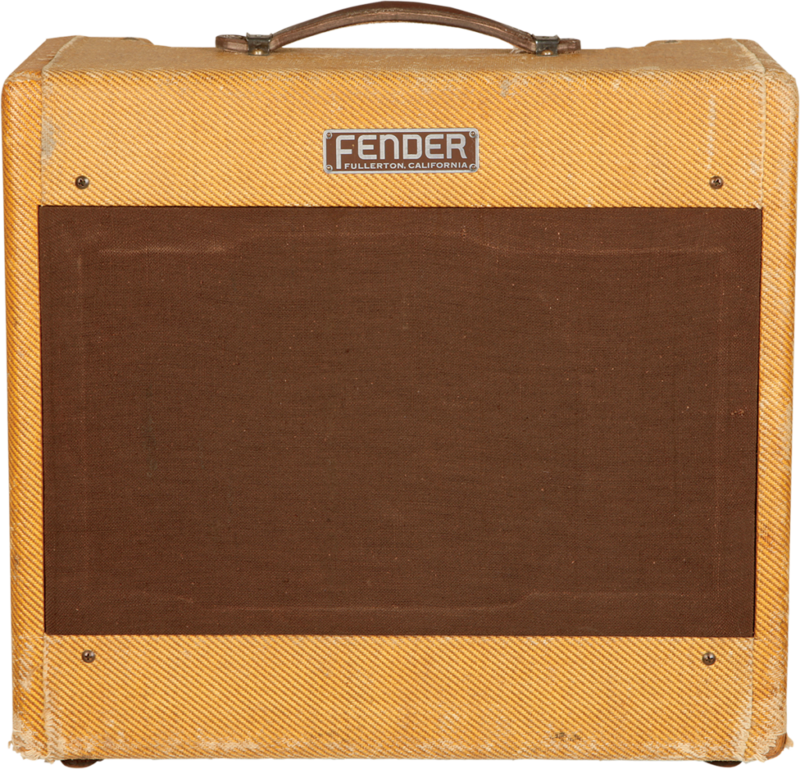 Scotty used this amp exclusively with Elvis from May 1955 up to and including the ’68 Comeback Special performance. Butts made around 68 EchoSonics and they are now understandably very scarce and valuable. Eventually, Butts licensed Rickenbacker to manufacture a production version called the Ek-O-Sound, for which circuit diagrams are available. They show a pair of cathode-biased 6L6 power valves that produced about 25 watts. As Elvis shows became bigger, Scotty augmented his stage sound with powered 50-watt satellite cabinets, each containing four eight-inch JBL speakers. The consensus among knowledgeable Scotty fans is that the speaker in his EchoSonic played a big part in Scotty’s tone. The EchoSonic EA-1 had a 12-inch University Model UC-121 Series 100, with a black basket and silver magnet. Given the mid-50s manufacturing date, it’s safe to assume it had an alnico magnet. An earlier TV-front Deluxe will sound much the same as Scotty’s 5C3; but the later 5D3 and 5E3 Deluxe models have a brighter and fiercer tone, with more gain. Although easy to find, prices for the early 50s Deluxes have been climbing steadily. Alternatively, you could have a 5C3 clone made. The Rift Tweed 15c (£999) comes with NOS 6SC7s and is hand-built here in the UK. Tracking down a Rickenbacker Ek-O-Sound would be easier than finding an EchoSonic, but not much. Instead, consider a cathode- biased 6L6 amp like the Lazy J 20 or Supro Royal Reverb. Alternatively, ask a custom-amp builder to make a replica for you – minus the built-in tape echo, it should be a reasonably straightforward build. Finally, set the amp so it breaks up slightly when you dig in hard and keep the treble low-ish, because Scotty used a full, deep tone without too much top end.